Looking at the evolution of occupational therapy through the eyes of four generations of Trojans. As occupational therapy turns 100 — and USC’s program turns 75 — we look back at the past century through the eyes of those who experienced occupational therapy’s evolution firsthand. Our story begins with Dottie Ecker, proudly representing the Greatest Generation, and finishes with millennial Kaitlin O’Hara. Each Trojan from the four generations shares a unique view of the profession, which has evolved from a craft-based technical practice to its modern day, evidence-based form in a variety of clinical settings with myriad specialties. Read on to find out how occupational therapy has changed (and how it has stayed the same) since its inception in 1917. For as long as Dottie Ecker can remember, she has been a working woman. At 14, she went door-to-door, selling handmade necklaces and pins. Then, when she was finally old enough, she eagerly applied for a job at a department store in downtown Los Angeles. Like many in the Greatest Generation (born between 1922 and 1945), Ecker strove for financial independence and chose to earn her own spending money. Now, retired only for one year, Ecker uses her 11-page curriculum vitae to help her recall her nearly 60-year career in occupational therapy. “I had forgotten some of the things I had done in my career after all those years,” she says, laughing. As a teenager, Ecker knew she wanted to work in health care so she surrounded herself with individuals already working in her dream career. She also accompanied her aunt, who was the principal of a rehab facility, to her workplace so she could learn more about health care. It was one of her aunt’s employees, who was a pre-OT student at USC, that introduced Ecker to occupational therapy. 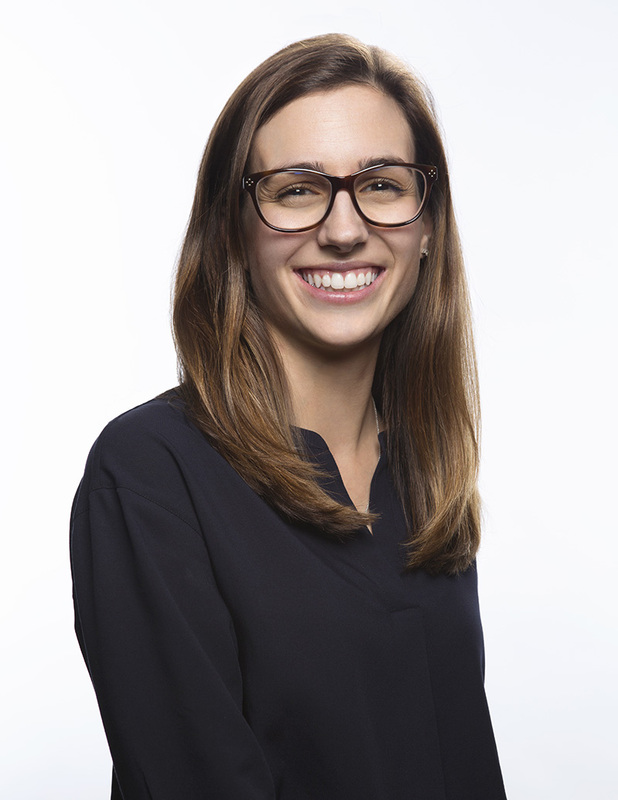 When it was time for Ecker to go to college, she chose to pursue her bachelor’s degree in occupational therapy at USC. At the time, a bachelor’s degree was required for an occupational therapist to become certified for practice. After completing her degree, Ecker landed a position at the Texas Rehabilitation Center in Gonzales, Texas. Ecker and her then-beau Roland were married in 1960. Afterward, they moved back to Southern California, where Ecker continued to work as an OT and teach up-and-coming occupational therapy professionals. It wasn’t until later in her career that she decided to pursue her master’s degree in occupational therapy at USC to extend her education as was suggested by her mentor, A. Jean Ayres ’45, MA ’54, PhD ’61. But the education was much different back then, she explains. Ecker also says that, at the time of her education, the scope of occupational therapy practice was different. Ecker also says the use of research was completely different in both education and practice. She again credits Ayres for introducing her to the concept of using published research to inform the way she practiced. Using peer-reviewed research to inform practice has since become the norm for the profession. Ecker believes she had a rich, fulfilling career — from taking care of pediatric patients and patients with disabilities to setting up a geriatrics rehab program at LAC+USC Medical Center. Throughout her career, Ecker also served as a clinical faculty member at USC Chan. In fact, she was selected to sit on the chair search committee that eventually chose Florence Clark PhD ’82 more than 40 years ago. “I had worked and taught with Florence so, of course, I knew she would do a great job,” she says. Ecker has also maintained active memberships in professional organizations, including the American Occupational Therapy Association, the Occupational Therapy Association of California and the World Federation of Occupational Therapy. Now that Ecker’s professional life has taken a back seat, she still maintains her involvement with USC. She is a member of the Trojan Guild, a USC social club composed of alumni and her former colleagues. Even before starting college, Colette Nagami was drawn to working in health care. She volunteered as a candy striper while she was still in high school and also took a job at an adult day care center. She developed an affinity for helping people and was certain that a career in health care would bring her satisfaction over the course of her professional life. When it came time to apply for college, Nagami declared her intent to pursue a degree in the health sciences. Although she was undecided at the time, she was leaning toward becoming a pharmacist. After a year of general education at USC, she was accepted into the pharmacy track, but her then-boyfriend and now husband warned her against it. He was a pharmacy major and knew that Nagami would be happier in a field that would afford her more direct contact with patients. When Nagami finally had her meeting with occupational therapy, she had no idea that she was about to find her calling. She met with Harriet Zlatohlavek ’45, MA ’52, the former chair of the department, who got to know Nagami and her interests before explaining to her how occupational therapy could be a match for her. Nagami recalls Zlatohlavek discussing different styles of learning and adaptation and how that interaction informed the way occupational therapists work with their patients. It was nothing short of fascinating to her. By the time Nagami began her studies, it was possible to get a master’s degree in occupational therapy and there were growing opportunities to do research in the field. But most of the students, like Nagami, finished their undergraduate work, which emphasized the technical aspects of occupational therapy. All the graduates of the Class of 1975 were generalists and most of them, says Nagami, went on to work in skilled nursing facilities or in acute hospitals. Like many of her contemporaries, Nagami went to work with psychiatric inpatients at Long Beach Memorial Hospital just after graduation. Just as her undergraduate studies at USC took unexpected turns, so too did Nagami’s career in occupational therapy. One of the first things she learned after working in a hospital was that, even among medical professionals, occupational therapy wasn’t a well-known professional. She started to recognize that there were patients who would benefit from occupational therapy, but who weren’t getting it because some doctors and nurses still didn’t know how to use occupational therapy to help their patients reach their greatest potential. As this fact became more and more clear over the first few years working in a hospital, Nagami decided to become an advocate for the profession and not just a practitioner. Nagami created a program for Long Beach Memorial Hospital that included education for both medical staff and for patients to help all of them understand the benefits of occupational therapy for different types of patients. Her next career move was to quit her job after moving to Orange County and not wanting to do a daily commute to Long Beach. Some of the doctors convinced her to see their patients in their offices when they truly needed occupational therapy. In another unexpected twist, Nagami was soon running a busy private practice and, as time went on, she set up offices in acute hospitals that would serve both inpatients and outpatients. Over time, Nagami started offering more than occupational therapy at her clinics. She had physical therapists, speech therapists, chiropractors and exercise physiologists working side by side with her occupational therapy staff. 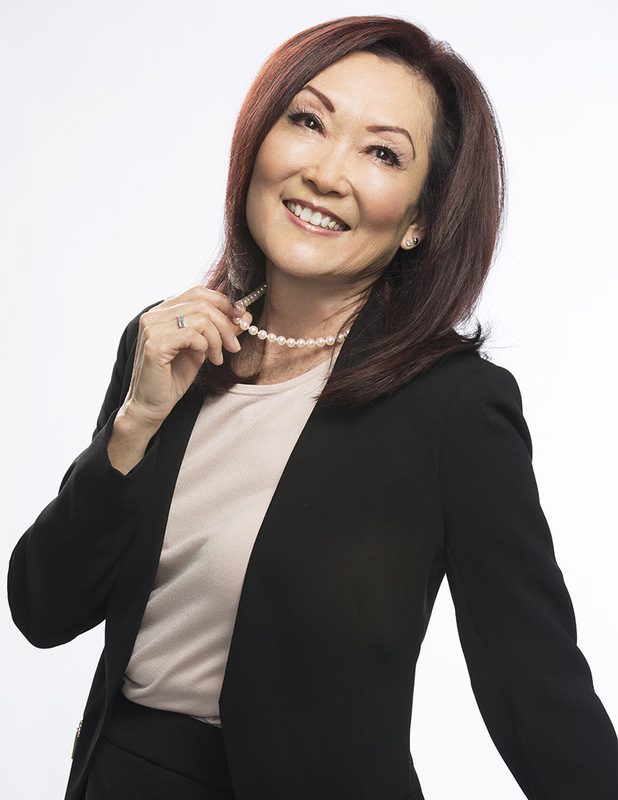 Becoming a business owner and running a string of 50 successful clinics was not anything that Nagami expected to do while she was in school. Now a member of USC Chan’s Board of Councilors, Nagami says she is impressed with how much occupational therapy has changed in the time since her graduation. She says she continues to be inspired by the depth of research and the march toward ever higher standards at the division. And, while she was an accidental entrepreneur, she applauds the fact that many students now enter occupational therapy with the intention of starting and running businesses after graduation. Though there are several keys to running a successful business, there is one that served her particularly well when she was growing her company. She hired Trojans. “During all the years that I was hiring therapists, I always knew that if someone came from USC, they would come with a great education and I could rely on that,” she says. For Jess Holguin, the calling came early. As an 18-year-old freshman, sitting in an “Introduction to Occupational Science and Occupational Therapy” course taught by then-Associate Dean Florence Clark PhD ’82, Holguin had an epiphany: He wanted to be an occupational therapist. That moment, in a class he took only because “the course description seemed interesting,” was the beginning of a love affair with a profession that has lasted more than two decades. As an undergraduate, Holguin split his incredibly regimented time between his coursework in occupational therapy (with a minor in psychology) and the football field. As USC football player no. 47, Holguin made some incredible college memories — scoring a touchdown against Cal at homecoming and making a tackle at the Rose Bowl. He also developed a laser-like focus on his studies. Holguin entered the workforce at a time when the market was flush with jobs. Like many born in Generation X (1965-1979), Holguin endeavored for a challenging career that valued making a difference over simply filling his pockets. He had been impressed with St. Jude Medical Center, having witnessed the care provided to family members over the years. Holguin began his 16-year career at St. Jude in what is known a “float position,” where he got the opportunity to work in various contexts to find his way in occupational therapy. “As a new grad, your first year in practice is very difficult because you don’t really know much of anything except for the fact that you don’t know much of anything,” he says, with a laugh. 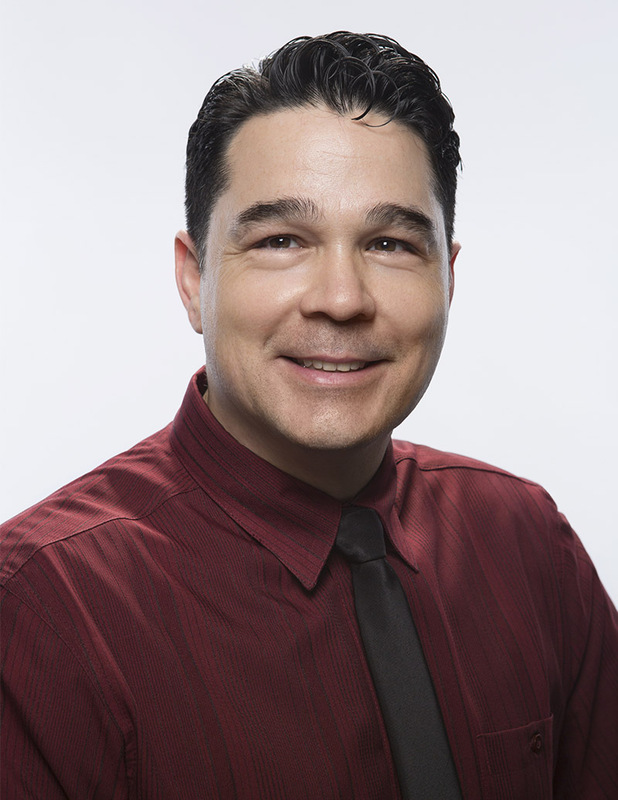 As a young practitioner, Holguin gained experience on the acute and skilled nursing floors as well as the outpatient day treatment center before finding his niche in the inpatient neurorehabilitation program. “I found more than I could have possibly ever hoped for in terms of a rewarding career and opportunities within the neuro setting at St. Jude,” he says. Nearly a year after starting his job, Holguin’s decision to practice at St. Jude was validated when his mother, who had previously suffered a number of illnesses, had spinal surgery complications, which resulted in a minor stroke. She was admitted to St. Jude. “I was overwhelmed but so inspired by the response of my colleagues,” Holguin says of watching the way his coworkers treated his mother. “It was a very early formative experience that had profound lasting effects. One of the effects was his deepening interest in neurorehabilitation, especially the subtle and lingering effects of neurocognitive dysfunction. Eight years into practice, Holguin, who had risen through the ranks at St. Jude to senior clinician, decided to go back to school to pursue master’s and doctoral degrees. As an experienced occupational therapist, Holguin found a greater appreciation for the graduate-level education than someone who had just come from a bachelor’s degree program. “It didn’t matter to them the same way it did me, having been in the trenches for eight years deeply caring about and arguing for the profession,” he says. Holguin also began teaching at USC Chan, where he was able to share his love for the profession with a whole new generation of occupational therapy students. “I loved being able to devote everything that I have to helping someone get there faster, more efficiently and ideally carrying the ball forward more than I could,” the former footballer says. And though Holguin’s life might have changed in many ways since he had that epiphany at 18 years old — he’s now married with two children, Garvey, 6, and Quinn, 3 — one thing has remained the same: his love for occupational therapy. Kaitlin O’Hara sees potential all around — in her community, in her future profession and in herself. That’s part of the beauty of being a student, the perpetually youngest generation of the Trojan Family. In the eyes of a novice, the future has never looked brighter. Around the same time, O’Hara joined Lifestyle Redesign for College Students, a program run by Chan faculty clinicians to support new collegians as they build health-promoting habits and routines for thriving within the campus environment. What had been a previously unknown profession quickly seemed to be a potential path ahead of her. Throughout her undergraduate career, O’Hara’s passion was ignited in other ways. When one of her Alpha Phi sorority sisters was diagnosed with multiple sclerosis, including symptom flare-ups that turned the sorority house’s stairs into complicated obstacles, O’Hara knew something had to be done. As a member at the time of the Panhellenic Executive Board — the governing body of USC’s 12 national sorority chapters — O’Hara got an insider’s look at USC’s Greek-letter fraternity and sorority houses. Throughout many of the off-campus houses, narrow staircases and hallways offer the only pathways to accessing common spaces and residential rooms. She developed a relationship with USC’s office that oversees accessibility and accommodations for students with disabilities to begin exploring possible retrofits and modifications. But because many of the structures were built in an era predating the Americans with Disabilities Act and are privately owned by their respective national corporations, legal compliance with physical accessibility standards is optional. The case is a classic lesson of how grassroots advocacy, not top-down mandates, is a more powerful tool for change. O’Hara has brought those experiences into her graduate student career too. She sits on the Health Sciences Campus’ Graduate Student Government Executive Board and is tasked with organizing community service activities for USC’s graduate and professional student body. She also sits on the board of the Occupational Therapy and Science Council, USC Chan’s largest student group. She has organized sandwich-making parties for distributing to homelessness agencies in Los Angeles’ Skid Row district, led a student team for a 5K race benefitting Special Olympics and is in the midst of rallying another team for the upcoming Walk MS at the Rose Bowl in Pasadena, Calif. This type of civic and social engagement is a value often ascribed to “millennials” like O’Hara. Born between 1980 and 2000, members of the millennial generation have been described as open-minded, confident and committed to principles of justice and equality. This generation of “digital natives” grew up in the Internet age and is being trained within the evidence-based practice paradigm, so their thirst for validated information should come as no surprise. Starting this fall, O’Hara will be entering the Chan doctorate of occupational therapy degree program. Her doctoral residency site will be the USC Occupational Therapy Faculty Practice, the very same clinic where she first found occupational therapy as a client nearly five years ago. While she isn’t sure where she will be heading after the doctoral program, she does have one long-term career goal. “I really admire how Dr. [Samia] Rafeedie makes the rehab process so human,” O’Hara says. Rafeedie is a clinical associate professor and director of the division’s entry-level master’s degree program. For the many ways that the profession has evolved since USC first began offering occupational therapy education in 1942, its core values are as timeless as ever. The more things change, the more they stay the same. 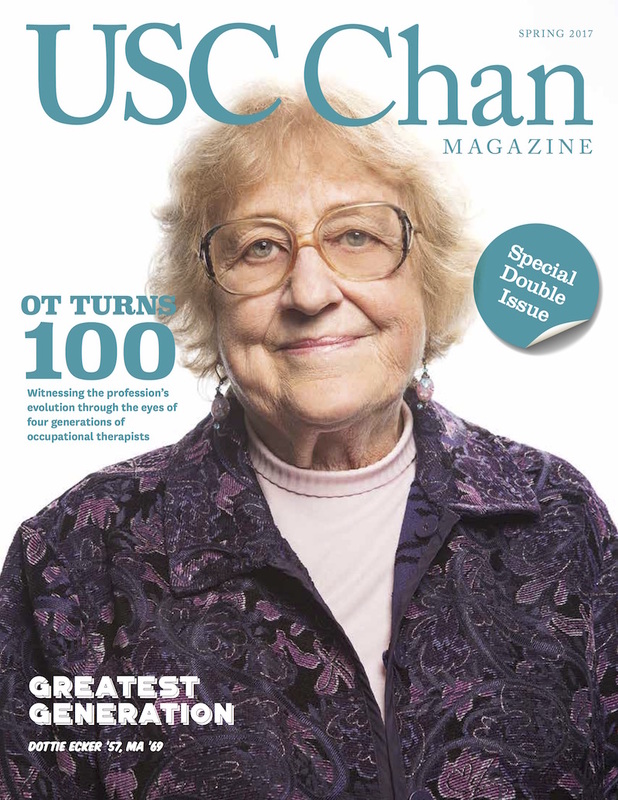 For 75 years, USC occupational therapists have been dedicated to serving the greater good of the profession. Here are a few landmark moments that highlight the Trojan Family’s enduring influence. In 1944, the Commanding General of the Army Service Forces approved 12-month “war emergency” courses designed to quickly train occupational therapists to serve in Army hospitals across the nation. Students began enrolling at five civilian schools including USC, the only such training program west of the Mississippi River. In 1947, USC opened the nation’s first post-professional degree program in occupational therapy. 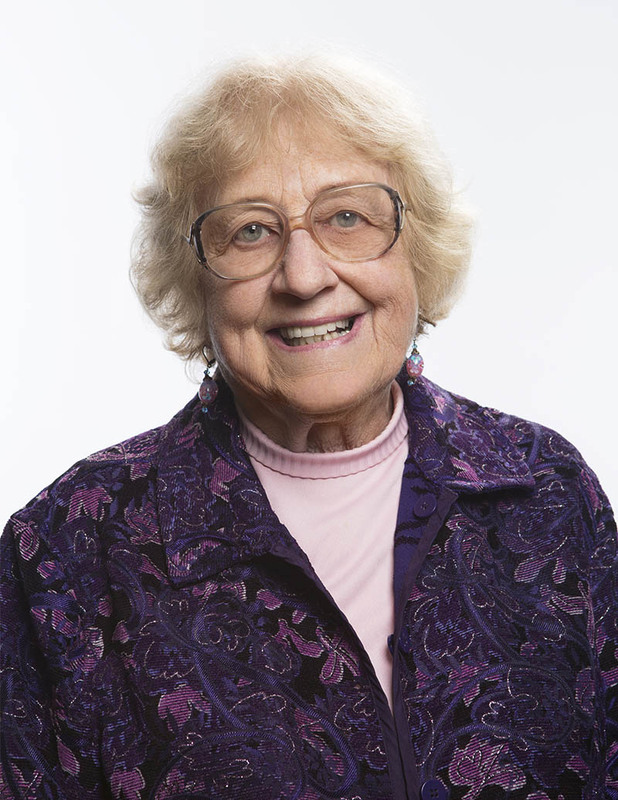 The following year, Wilma West MA ’48 became the first person in the country to receive a graduate degree focused on occupational therapy, with her thesis entitled, “A Proposed Kinesiology Syllabus for Occupational Therapy Based on an Analysis of Requirements of the Profession” to earn her master of arts degree in health, physical education and therapy. In 1961, Mary Reilly ’51 received the American Occupational Therapy Association’s Eleanor Clarke Slagle Lectureship Award. She was the second Trojan, after faculty member Margaret Rood’s 1958 Slagle Award, to receive what has become the profession’s highest academic honor. The hypothesis Reilly posited in her lecture,“that man, through the use of his hands as they are energized by mind and will, can influence the state of his own health,” would become one of the profession’s most cherished and enduring quotations. During the intervening decades, 15 Trojans have received the Slagle Award. In 1997, USC researchers led by Florence Clark published the first occupational therapy research to ever appear in the prestigious Journal of the American Medical Association. Their article, “Occupational Therapy for Independent-Living Older Adults: A Randomized Controlled Trial,” documented significant benefits of the USC Well Elderly Study across various health, function and quality-of-life domains, suggesting that preventive health programs based on occupational therapy may mitigate the health risks of older adulthood. In 2014, USC again made history by receiving the first naming endowment gift, the largest ever made to any occupational therapy educational program in the history of the field. USC Trustee Ronnie C. Chan MBA ’76 and his wife, Barbara, dedicated $20 million to endow and name the division, which is today known as the USC Mrs. T.H. Chan Division of Occupational Science and Occupational Therapy.